Home > Special Offers > Dealer > Stuff a Sorento! 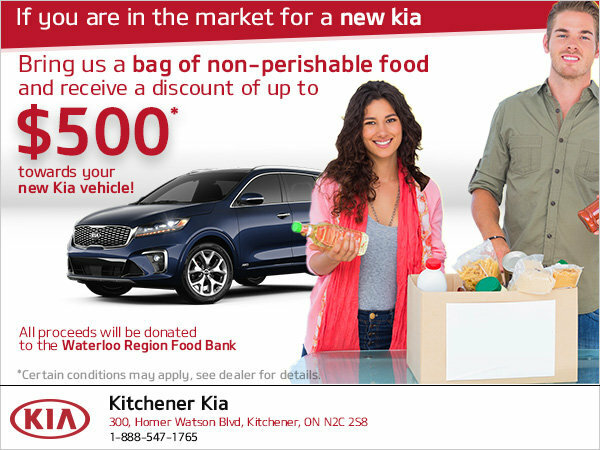 If you are in the market for a new Kia, visit Kitchener Kia today with a bag of nonperishable food items and receive a discount of up to $500 on your new vehicle! All proceeds will be donated to the Waterloo Region Food Bank and greatly appreciated by everyone involved! We are accepting donations between September 17th - October 5th, 2018. Visit us today to get this great offer AND help our community!